Vedic Sanskrit is an Indo-Aryan language. It separated from its sister Avestan (an Eastern Iranian language) around 1800 BCE, and then developed into a sophisticated language. Vedic Sanskrit is, along with the Avestan language, one of the oldest Indo-European languages. 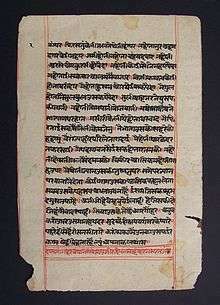 It is unique to ancient India, and the oldest language for which extensive documents have survived into the modern era. It has provided insights into the parent Indo-European language. Vedic Sanskrit is the language of the Vedas, texts compiled over the period of the mid-2nd to mid-1st millennium BCE. It was orally preserved as a part of the Śrauta tradition of Vedic chanting, predating the advent of alphabetic writing in India by several centuries. Vedic Sanskrit is an archaic language, whose consensus translation has been challenging. From about the 5th century BCE, in the classical period of Iron Age India, Vedic Sanskrit gave way to Classical Sanskrit as defined by the grammar of Pāṇini. Ancient Sanskrit text on hemp-based paper. Hemp fiber was commonly used in the production of paper from 200 BCE to the late 1800s. The separation of proto-Indo-Iranian language into Avestan and Vedic Sanskrit is commonly dated, on linguistic grounds, to roughly 1800 BCE. The composition of the oldest hymns of the Rigveda is dated to several centuries after this division, or to roughly 1500 BCE. Both Asko Parpola (1988) and J. P. Mallory (1998) place the locus of the division of Indo-Aryan from Iranian in the Bronze Age culture of the Bactria–Margiana Archaeological Complex (BMAC). Parpola (1999) elaborates the model and has "Proto-Rigvedic" Indo-Aryans intrude the BMAC around 1700 BCE. He assumes early Indo-Aryan presence in the Late Harappan horizon from about 1900 BCE, and "Proto-Rigvedic" (Proto-Dardic) intrusion to the Punjab as corresponding to the Gandhara grave culture from about 1700 BCE. According to this model, Rigvedic within the larger Indo-Aryan group is the direct ancestor of the Dardic languages. The hymns of the Rigveda are thus composed in a sacred language which was based on the natural language spoken in Gandhara during the early phase of the Gandhara grave culture at the end of Bronze Age India. This liturgical language over the following centuries came to be separated from spoken vernaculars and came to be known as the "artificial" or "elaborated" (saṃskṛta) language, contrasted to the "natural" or "unrefined" prākṛta vernaculars by the end of the Vedic period. Rigvedic The Ṛigveda retains many common Indo-Iranian elements, both in language and in content, that are not present in any other Vedic texts. Its creation must have taken place over several centuries, and apart from the latest books (1 and 10), it must have been essentially complete by around the 12th century BCE. Mantra language This period includes both the mantra and prose language of the Atharvaveda (Paippalada and Shaunakiya), the Rigveda Khilani, the Samaveda Samhita (containing some 75 mantras not in the Rigveda), and the mantras of the Yajurveda. These texts are largely derived from the Rigveda, but have undergone certain changes, both by linguistic change and by reinterpretation. Conspicuous changes include change of viśva "all" to sarva, and the spread of kuru- (for Rigvedic kṛno-) as the present tense form of the verb kar- "make, do". This period corresponds to the early Iron Age in northwestern India (iron is first mentioned in the Atharvaveda), and to the Kuru Kingdom, dating from about the twelfth century BCE. Samhita prose (roughly 1100 to 800 BCE). This period marks the beginning collection and codification of a Vedic canon. An important linguistic change is the complete loss of the injunctive and of the grammatical moods of the aorist. The commentary part of the Black Yajurveda (MS, KS) belongs to this period. Brahmana prose (roughly 900 to 600 BCE) The Brahmanas proper of the four Vedas belong to this period, as well as the Āraṇyakas, the oldest of the Upanishads (Brihadaranyaka Upanishad, Chāndogya Upanishad, Jaiminiya Upanishad Brahmana). Sutra language This is the last stratum of Vedic literature leading up to 500 BCE, comprising the bulk of the Śrautasūtras and Gṛhyasūtras and some Upanishads such as the Katha Upanishad and Maitrayaniya Upanishad. Vedic Sanskrit had a voiceless bilabial fricative (/ɸ/, called upadhmānīya) and a voiceless velar fricative (/ɸ/, called jihvāmūlīya), which used to occur when the breath visarga (अः) appeared before voiceless labial and velar consonants respectively. Both of them were lost in Classical Sanskrit to give way to the simple visarga. Vedic Sanskrit had a retroflex lateral approximant (/ɭ/) (ळ) as well as its aspirated counterpart /ɭʰ/ (ळ्ह्), which was lost in Classical Sanskrit. The vowels e (ए) and o (ओ) were actually realized in Vedic as diphthongs /ai/ and /au/, but they became pure monophthongs /eː/ and /oː/ in Classical Sanskrit. The vowels ai (ऐ) and au (औ) were actually realized in Vedic as hiatus /aːi/ (आइ) and /aːu/ (आउ), but they became diphthongs /ai/ (अइ) and /au/ (अउ) in Classical. Vedic Sanskrit had a pitch accent, which could even change the meaning of the words, and was still in use in Pāṇini's time, as can be inferred by his use of devices to indicate its position. Later, it was replaced by a stress accent limited to the second to fourth syllables from the end. Vedic Sanskrit often allowed two like vowels to come together without merger by sandhi. 1 2 3 Philip Baldi (1983). An Introduction to the Indo-European Languages. Southern Illinois University Press. pp. 51–52. ISBN 978-0-8093-1091-3. ↑ e.g. EIEC, s.v. "Indo-Iranian languages", p. 306.